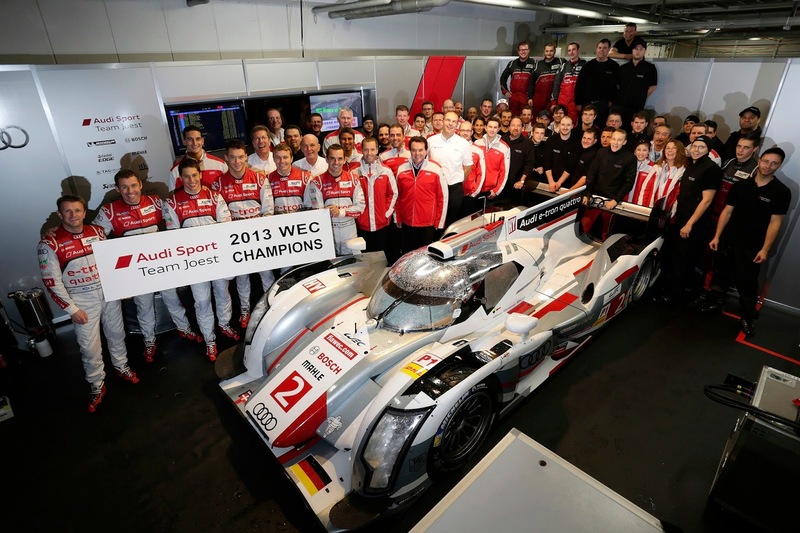 Audi has defended its titles early in the FIA World Endurance Championship (WEC) in Japan. The success with the R18 e-tron quattro was achieved by Audi Sport Team Joest in odd circumstances: Heavy rain at Fuji meant that not a single lap could be completed under the Green Flag. In the end, the leaders of the standings, Loïc Duval/Tom Kristensen/Allan McNish (F/DK/GB), as the best Audi team took second place overall in the race, their team-mates Marcel Fässler/André Lotterer/Benoît Tréluyer (CH/D/F) were classified in fourth place in the LMP1 category. Consequently, the drivers’ classification will be decided between the two Audi squads at the remaining rounds. At the sixth of eight WEC rounds, difficult weather conditions prevailed. Steady rain had prompted race control to start the endurance race behind the safety car. But the 4.563-kilometer track at the foot of Mount Fuji was too wet for the race to be released in these conditions, so the stewards of the meeting interrupted the race after eight laps. A resumption behind the safety car after two and a half hours ended in another interruption 22 minutes later. Another two hours later, the participants again started behind the safety car before the race was finally stopped after just one lap. The stewards decided that force majeure had prevented a regular course of the race. As a result, the drivers, due to the shorter race distance, were awarded half the points equating to their positions – even if they had not been in the cockpit at all. With two remaining rounds, Audi is out of reach in the manufacturers’ World Championship with a 66.5-point advantage. As the best Audi squad in the race, the leaders of the standings, Loïc Duval/Tom Kristensen/Allan McNish, who had started from position four, achieved second place. They extended their lead in the Championship to 40.75 points. Among other things, the Audi designated as car number ‘2’ benefited from the fact that the number ‘8’ Toyota, which had qualified in position two, could not assume its place on the grid. As a result, the car had to start from the pit lane and was unable to overtake under safety car conditions. The number ‘1’ Audi suffered misfortune. André Lotterer/Marcel Fässler/Benoît Tréluyer initially led the race from position one on the grid. When debris impaired the intake duct of the engine Audi Sport Team Joest decided to perform a repair for safety reasons. The team used a second caution period to do so when there were prospects for a weather improvement and thus a resumption of the race. However, since this did not occur and the rain became heavier again, last year’s World Champions had to settle for fourth place in their class and 26th place overall. For the first time in almost exactly one year, the Audi LMP sports cars thus had to formally admit defeat. At Shanghai, the next WEC round will be on the agenda in three weeks from now. There, Audi could have another reason to celebrate, as an early title decision in the drivers’ classification is probable in China.